Looking for an idea to customize the Sunny Day Shorts? One easy way is to add pockets. The beach bum shorts tutorial shows you how to draft your own front pockets. And don’t forget about the hexagon shaped pockets tutorial either. 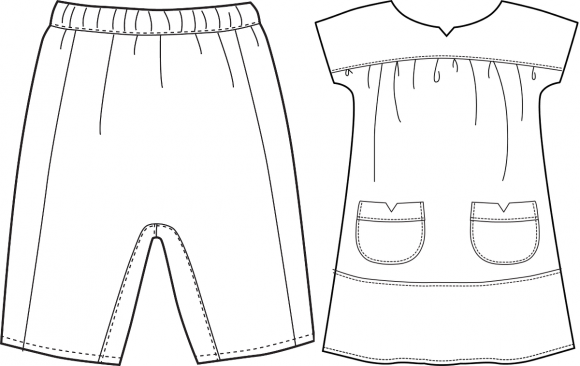 Now, if you are looking for more options and you happen to own a few Oliver + S sewing patterns, then you probably already have some pocket patterns that you can use. I’ve put together a list in no particular order of some of the patterns that include pockets that I thought would work. Also I found a couple of examples that others have made using Oliver + S pockets. Before I get started, though, you might find that a few little changes might need to be made to make them work, like for example, if the pockets are a little bit too big, try going down a size or two. Warning in advance, this is a long list! 1) The Sandbox Pants have front patch pockets and button-through back patch pockets. 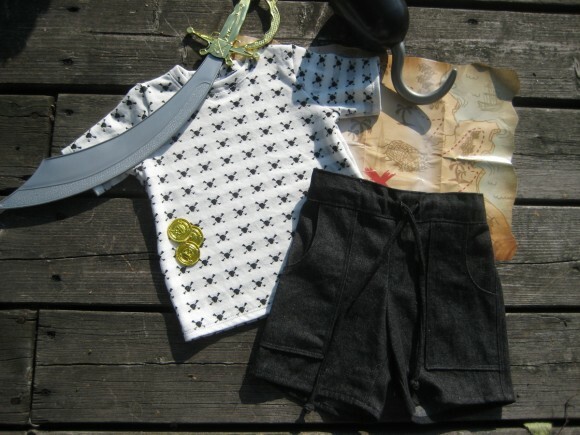 Here you can see an example where Deb added the Sandbox Pants front patch pockets to a pair of Sunny Day Shorts to make this awesome pirate outfit (which includes a School Bus T-shirt). 2) The Art Museum Trousers feature front pockets and back welt pockets. Be sure to check out our welt pockets step-by-step photo tutorial to see that it’s really not a difficult technique. 3) The Field Trip Cargo Pants have front pockets, back patch pockets, and large cargo pockets at the side seams. I might suggest adding length to the shorts for the side cargo pockets to work. Otherwise wow, in one pattern there are three different pockets that could work! 4) The Lullaby Layette has cute little back patch pockets on the elasticized pull-on pants that go up to size 24 months. Patricia placed these pockets on the back of a pair of 2T shorts, aren’t they adorable? 5) The Ice Cream Dress features v-notch patch pockets which I think could be used as front, side, or back pockets. 6) The Playtime Dress and Tunic have set-in pockets and I would suggest to eliminate topstitching the pockets. 7) The Hopscotch Skirt feature takeout box shaped pockets which I think would be cute as side pockets. 8) The Sketchbook Shorts have easy front pockets. 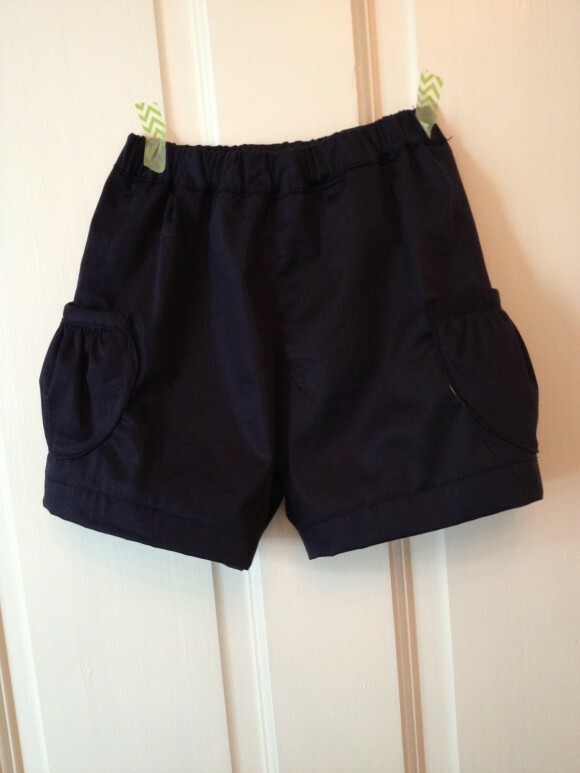 9) The Puppet Show Shorts feature adorable gathered bias-trimmed side pockets. 10) The Sunday Brunch Skirt has nice front pockets. 11) The After School Pants have front pockets and back patch pockets. This one has the option of adorable ruffle details at the front pocket opening. 12) Finally, the Jump Rope Dress features two different types, both the side patch pockets and the front gathered bias-trimmed patch pockets which I feel could be placed in the front or on the sides. 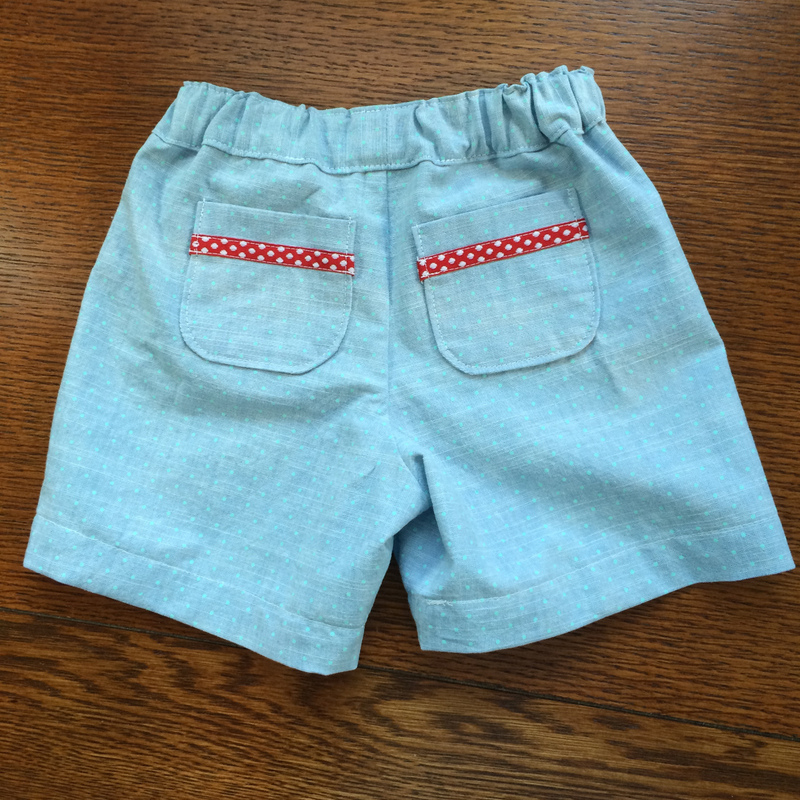 Emily put the gathered bias trimmed patch pockets on the sides of these shorts, achieving adorable results! So there you have it, there are quite a few options to try. Using the pockets from the patterns you already own gets more mileage out of them which is always a great feeling, isn’t it? Please do let me know in the comments section if there are some pockets that would work that I forgot about. Also if you’ve sewn up a pair of Sunny Day Shorts where you added Oliver + S pockets please leave a link so we can all see. Thank you, this is such a helpful post! Time ago you asked for suggestions for the blog, more similar posts on techniques we can learn from the patterns would be lovely, please e.g. a post featuring the patterns with zips; those with buttonholes; facings; different sleeve styles etc. I am getting to know the boy patterns as I have two sons but I am keen to learn more about the different girl patterns too so I can practice more sewing skills and also sew for our female cousins. 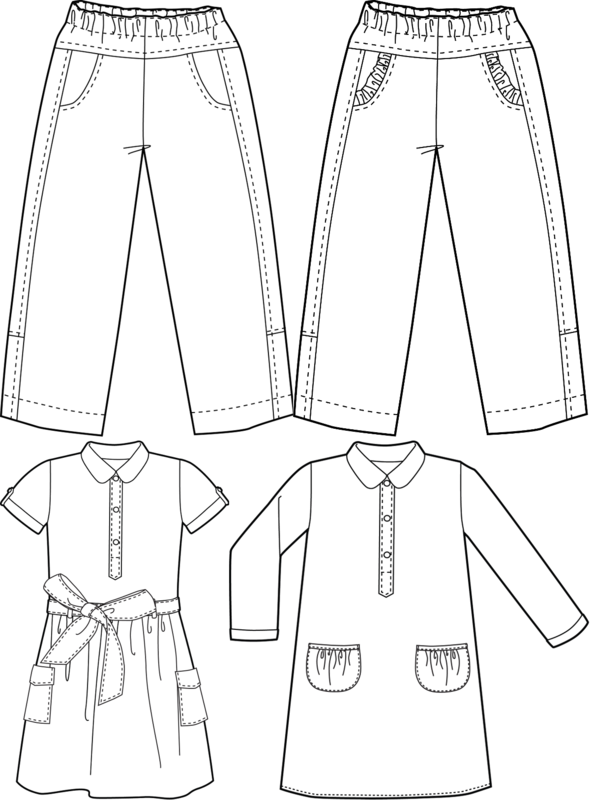 LOTS OF OPTIONS FOR ADDING POCKETS TO KIDS’ CLOTHES FROM Oliver & S patterns: pants, shorts, skirts, and dresses. . . with such a variety of pocket styles. FAB photos of 3 shorts: Deb’s patch front pockets for a pirate outfit means a place for treasures to stay hidden and Patricia’s thin strip of white polka dots on red fabric adds pizzazz to her toddler’s light blue shorts. I really like the gathered patch pockets that Emily sewed on each side of black shorts. BRAVO for all 3 moms’ creative use of pockets because kids love to pick up little things and so they NEED pockets! Numerous suggestions with line drawings show pocket placements. Thanks for info as I plan to tell a couple nieces who sew and have young kids about this, Rachel. Good post Rachel and lots of pocket ideas for inspiration. I had forgotten about the Hopscotch pockets – better go back to my O+S pattern box and dig out that pattern. Maybe that has some information that you are looking for?